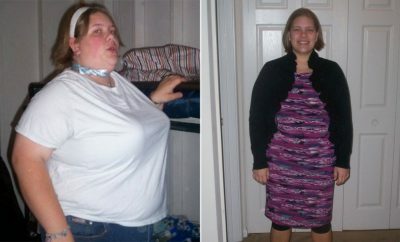 Seeing how she really looked inspired Lori Johnson to lose 150 pounds. I’ve always hated having my picture taken. As one of the bigger chubby girls growing up, I learned to “duck and cover” whenever someone pulled out a camera. But in August 2001, I was sitting next to the bride at a wedding shower and couldn’t move fast enough. Four months earlier, my 4-year-old daughter, Jenna, had been diagnosed with type 1 diabetes and hospitalized for 5 days. The stress of caring for a sick youngster and my 7-month-old son, Landon–on top of working full-time as a graphic technician–propelled me into a 40-pound eating binge. After everyone went to bed, I’d devour all the sugary treats Jenna could no longer have–ice cream, candy bars, and cookies. At work, I’d buy a few candy bars and four hot ham-and-cheese stuffed sandwiches and hide in the bathroom to eat them. Eating was my secret pleasure, but walking soon became a struggle. I couldn’t climb stairs without getting winded. I had to lean a certain way to get into my car, and I stopped wearing my seat belt because it was too uncomfortable. While teaching Jenna to skate, I had to sit and rest after just one trip up and down the driveway. She begged, “Mom, please, do it again,” but I couldn’t move. When I saw that awful photo in August, I couldn’t hide any longer. I had to change–if not for myself, then for Jenna. I began by confiding in my mom, who had lost 40 pounds. My problems seemed so overwhelming, but she told me to tackle them one small step at a time. That’s literally what I did. I started taking the stairs at work instead of the elevator. It was just one flight, but I barely made it, huffing and puffing all the way. After just 2 weeks, I was climbing those stairs like a champ. I felt so proud. Next up was the daily 64-ounce soda that I’d drink on the way to work. I kept the big cup but filled it with water. 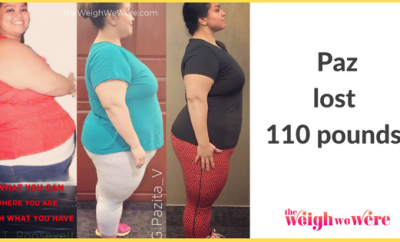 In 2 weeks, I lost 10 pounds. Then came a tougher task–breaking my snacking habits. No more king-size Reese’s peanut butter cups or late-night trips to the burger joint for three cheeseburgers. I substituted healthier snacks, such as carrot sticks, apple slices, and grapes, and constantly drank water to fill me up. Surprisingly, I wasn’t that hungry, which probably meant that my body really didn’t need all that food I ate for emotional reasons. And whenever my mood pointed me in the direction of the refrigerator, I called my mom for support. Because of Jenna’s diabetes, I had to read nutrition labels and was shocked to discover that my problem was not only what I ate, but also how much. When I learned that a serving of cereal was 1/2 cup, I realized that I was eating six times that amount. And I wasn’t only overeating cereal. 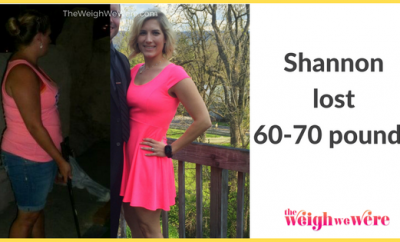 I started measuring my portions instead of filling the entire bowl or plate, and by Christmas–5 months after I’d started making changes–I’d lost 50 pounds. The next step was exercise, but I thought I didn’t have time–plus I hated the thought of being the biggest girl in the gym. About a year from when I first started, I reached my goal weight of 130. Where life once was a struggle, now it’s a joy. I have no trouble keeping up with my kids, and last summer, I bought my first bathing suit in 5 years. These days, I love having my picture taken! Get a hobby. “Have other things to do with your time besides eating,” says Johnson, who makes scrapbooks for her kids. Face your fears. Some of the unhappiness Johnson buried with food came from the mistaken notion that her daughter couldn’t have a “normal” childhood–going to birthday parties and hosting sleepovers. But when she learned that kids with diabetes can do these things, it lifted her spirits and curbed her compulsive eating.